Halloween fun isn’t just for youngsters anymore. Seniors often enjoy getting in on the festivities. Plan a seasonal party and include games that all can play. Live-in Oshkosh caregivers recommend the following Halloween-themed games for seniors and their families. Put candy corn or similar candy in a jar and let guests guess the number of pieces. The person who comes closest to the actual count wins a prize. Another option involves guessing the weight of a pumpkin, though it’s not recommended for seniors with physical disabilities. This game is ideal for seniors who require in-home care in Oshkosh. Round up some white butcher paper, markers and tape. Create individual “chalk” outlines of the partygoers and hang the masterpieces around the dining or living room area. Images or items personalizing each outline might also aid in the identification process. Have guests guess who the identity of the victims are. Participants with the most right answers win. This game can be played both indoors and out. The activity is also a wonderful way of encouraging upper body exercise and range of motion. Acquire one large pumpkin and several miniature gourds. Position the large pumpkin up to six feet away from a designated starting line. Allow each player to roll his or her smaller pumpkin toward the larger target. The individual that comes the closest wins. Give each participant a piece of paper and a pencil. When the game leader says, “go” each player must write as many Halloween-related words he or she can think of using as many of the letters of the alphabet as possible. Stop the game after 10 minutes and tally the results to determine the winner. Tell your guests the plot line of a famous horror movie. Keep in mind that the movie must be relevant to the senior generation. Using only hints from the plot, let the guests guess the name of the movie. Keep score of the correct answers. 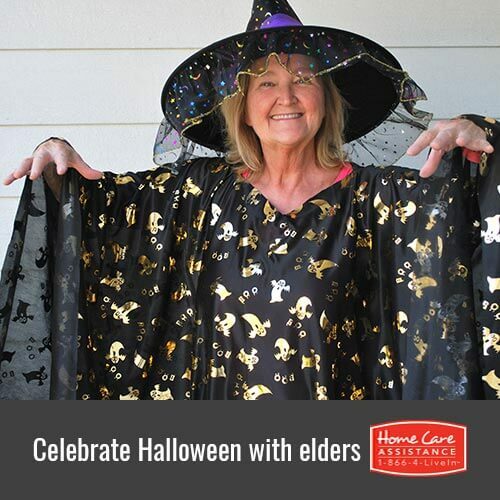 Halloween is great for kids, but seniors can have some fun with it, too. For more tips on giving your loved one a Halloween to remember, contact Home Care Assistance at 920-710-CARE (2273) today. Not only do we provide comprehensive stroke, dementia and Alzheimer’s in-home care in Oshkosh, but we also help seniors boost longevity and quality of life. Call today to schedule a free in-home consultation with a friendly Care Manager.